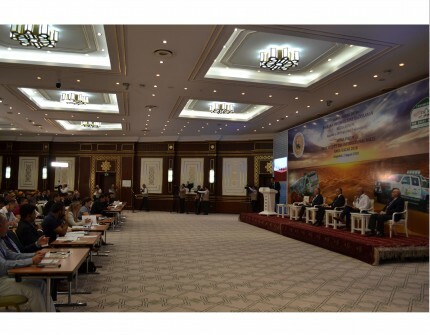 On August 5, 2018, a media forum devoted to the issues of familiarization with the international car rally Turkmen Desert Race «Amul-Khazar 2018" in Turkmenistan was held in the conference hall of the "Sport" hotel. The event was organized by the Ministry of Foreign Affairs of Turkmenistan jointly with the Ministry of Internal Affairs and the State Committee for Television, Radio Broadcasting and Cinematography. The forum was attended by the leading experts in the world of motorsport, heads of international transport organizations, representatives of embassies and international organizations, as well as foreign journalists accredited in Turkmenistan, representatives of the media from 16 countries, as well as representatives of local media. The solid composition of the delegates of the media forum attests to the great interest in the world information space towards the international rally. Speaking to the audience, foreign organizers and leaders of various ministries and departments of Turkmenistan, responsible for preparing the rally, spoke in detail about preparations for the forthcoming international rally (Turkmen Desert Race) "Amul-Khazar 2018". The general director of the rally-marathon "Africa Eco Race" Jean-Louis Schlesser shared experience in holding such competitions and answered all the questions in detail. During the plenary sessions, the participants of the media forum discussed the issues of information support of motor racing, the route of which will run along the Great Silk Road, crossing the Karakum desert and covering many localities. Also, the participants of the forum were shown a video that tells about the successes of Turkmen sports and the policy of the head of state in this field. Turkmenistan increases its global authority as a country having successful experience in holding major sports events of international level, including in motor sports. And the accumulated experience will enrich such a significant project, realized at the state level, as the rally "Amul-Khazar 2018". The participants of the forum, in the framework of the cultural program, visited the Olympic town of Ashgabat and then the International Equestrian Center, where they were demonstrated the playfulness, beauty and swiftness of the Akhal-Teke horses. Also, delegates visited the Sports Car Center of the Ministry of Internal Affairs of Turkmenistan, the State Museum of the State Cultural Center of Turkmenistan and the historical-cultural reserve "Nusai".